Planning any trip will be impossible without us. At Planet of Hotels, we have all the best hotels and apartments worldwide, giving you the best choice that fits your taste and budget. Read reviews, check out the photos, and choose the best hotel to rest after a tiring day on the surfboard. Surfing is like a new type of religion for Americans. The industry is in bloom and is constantly developing, and the conditions for this entertaining sport are considered to be the best in the world. Moreover, there are plenty of manufacturers that produce equipment, and everything necessary for this activity. America fascinates with a variety of surfing spots with a highly developed infrastructure. Surfers with any training background and budget can find a place that will meet or even surpass their expectations, leave marvelous impressions and make them come back over and over again. If you want to discover the American paradise for surfers, let’s take a closer look at 5 most popular destinations in the country of freedom. 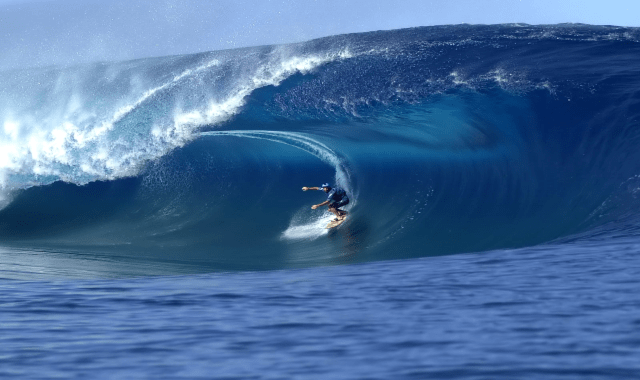 Hawaii is not only a splendid resort but also a heaven in the ocean for all the adrenaline lovers, where the highest, purest and the most dangerous waves are born. This is the place surfing comes from. Locals were riding on boards cut from the trees, which took Captain Cook by a great surprise when he saw it for the first time. The Hawaiian Islands, located in the northern part of the Pacific Ocean 3700 km from the continent, offers a diversity of beaches, namely on such islands as Hawaii, Maui, O’ahu, Kauai. Waikiki beach in the center of Honolulu has a big amount of schools and will cordially teach newbies, and its waves are more suitable for beginners. Pipeline beach on the northern coast is a better choice for seasoned profs due to its higher and more intense waves. Sunset Beach, Waimea Bay, and Banzai Pipeline are the most popular surfing spots that attract people from all over the world. What makes these beaches a perfect choice is that they give a chance to catch a wave both to advanced sportsmen and amateurs. 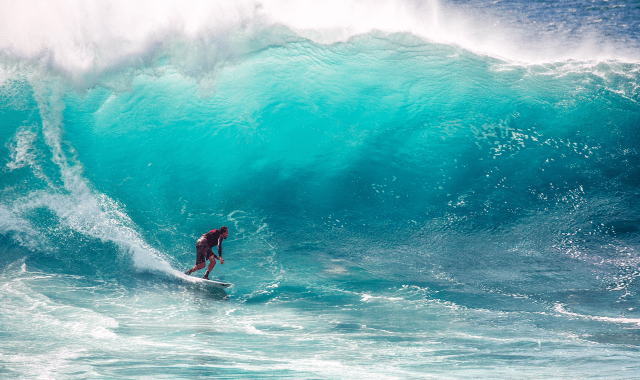 Oahu’s North Shore hosts international famous championships such as Vans Triple Crown of Surfing. 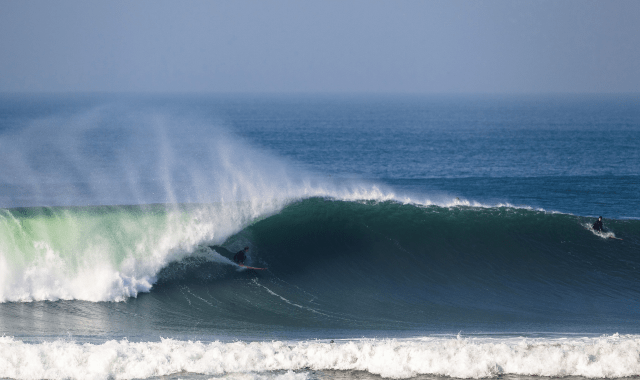 In winter, the waves are an ideal match for professionals due to the magnitude, but in summer all the rookies are more than welcome to improve their surfing skills and conquer the calmers waters of the Pacific Ocean. Los Angeles is not only about the Hollywood sign and celebrities, it’s also another popular surfing spot in the USA. The Southern coast will perfectly fit any surfer.The bottom contour, climate and structure of the Pacific ocean in this area generates waves all the year round. This city is literally interspersed with stunning beaching for waves conquering such as Venice Beach, Surfrider Beach, Point Dume, El Porto Beach, Topanga Beach, Manhattan Beach and dozens of others. Not only breathtaking views and an opportunity to surf next to the movie star attract people, but also a great amount of surfing schools, worldwide known shapers who produce boards, locals who treat novices kindly, as well as the lifeguarding towers on each surf spot, that are keeping their eyes on you and are always ready to help. Many Los Angeles’ beaches have webcams installed which allows you to check on the waves in the real-time mode. Surfrider Beach located between the Malibu Pier and the Malibu Lagoon is in top-10 surf spots in the world. It’s right-hand break waves are perfectly smooth and long, and it’s considered to be the place where the surfing culture of LA was born. This destination is recommended for those who firmly stand on the board and know where and when to conquer the wave. It’s crowded with locals who are surfing every day and won’t let you ride if see that you are not prepared enough. San Francisco is not only a Silicon Valley, Golden Gate bridge and the famous cable car system. The northern coast of California is also a beautiful destination for surfers. Conditions here are more severe: the water temperature is lower, there are reeves, sharks, strong winds and powerful surf breaks. However, it doesn’t stop extreme-seekers from all around the world. In 45 km from San Francisco located the famous Mavericks beach where waves can reach 60 feet (18 m) in height. The surfing competitions like Titans of Mavericks and others take place here and gathers the most courageous sportsmen. Ocean Beach located in the western part of San Francisco. It’s a broad sandy beach 5 km long which upwelling makes it a perfect destination for advanced surfers. Local infrastructure is beautifully developed for surfing. Here you can find a variety of places to rent a board for surfing or windsurfing, lifeguarding towers, theme shops and an abundance of cafes for those to refresh yourself after another ride. Remember, that waters in this area are really dangerous and cold, so be really careful and don’t forget your hydro costume. The southern city in the State of Florida – Miami provides an ideal combination for active recreation, to enjoy the regional flavor, turquoise waters, and climate. There is no bad season in Miami. In winter the temperature doesn’t fall lower than 19 degrees Celsius. Here you can find a beach appealing to any surfer – South Beach, South Pointe Park, Lummus Park and North Shore Open Space Park. However, be careful pursuing the waves as Florida ranks as a state where people and sharks unpleasant communication happens pretty frequently. If you need a piece of advice, you can easily ask locals who will recommend you the safe place for riding. When you ask locals where to go surf, the majority will advise you the South Beach. There you can find a classy beach break from July to November. It has plenty of shops, surf schools, lifeguarding towers and cafes who do all the best to make the surfing conditions the most appealing to the guests. There’s also a chance to catch the same wave with a famous actor, businessman or singer. Cape Cod a picturesque peninsula on the north-west of the USA, only 120 km from Boston. Its climate, landscapes and beautiful nature attract many tourists each year. The eastern part of the island is washed by the Atlantic Ocean which provides remarkable opportunities for surfers. 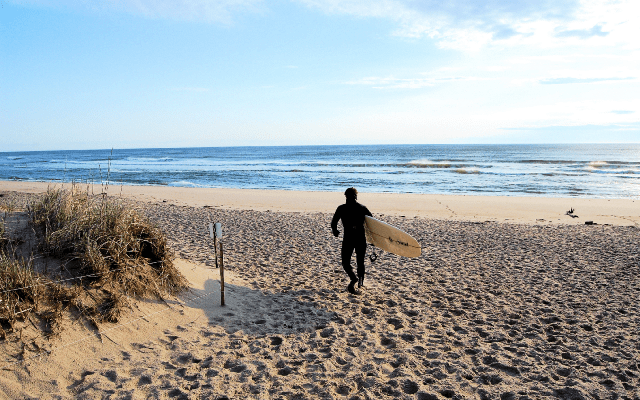 One of the best things about Cape Cod is the number of beaches and beach breaks, where you can find isolated spots to catch the waves. The Atlantic waters are rather cold so don’t forget to pack the wetsuit. Nauset is a 16 km long sandy beach with biggest waves on the East coast, few rocks, seals, and lifeguards. This place will perfectly fit both newbies and seasoned pros. The best surfing conditions are during the seasons’ transitions. 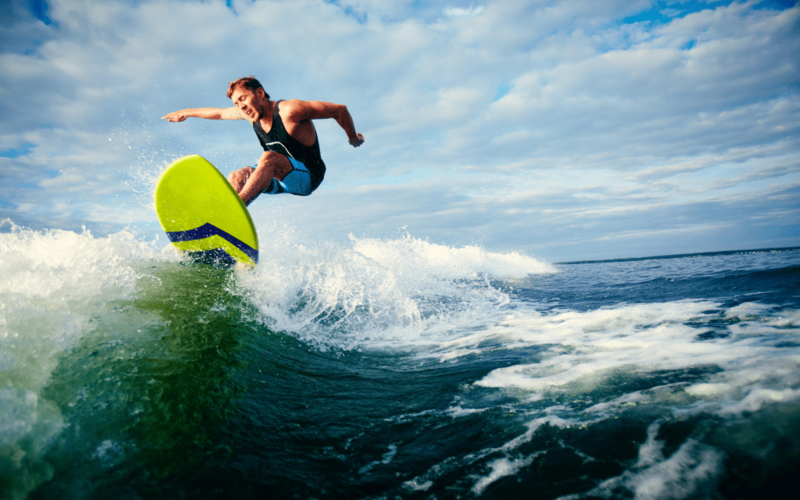 Novices can arrive in summer when waves are not too high to master their skills. What attracts people to this destination is its clear beaches and absence of people. My name is David Lieberman. I work as the president of Planetofhotels As one of the founding members of Planetofhotels, I have helped the company from its initial concept into the leading hotel reservation services. Also, I am a technology investor and advisor, helping companies and entrepreneurs with their projects and sites.